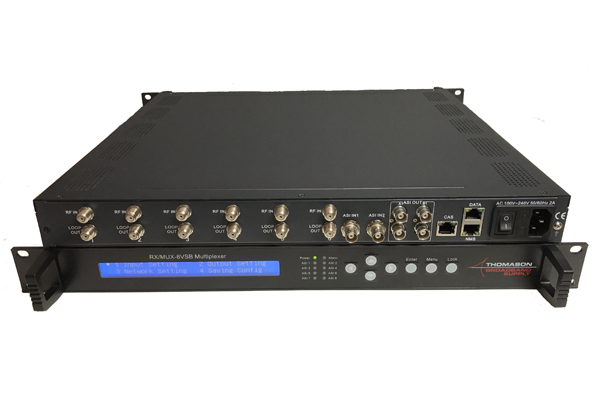 Our RX/MUX series multiplexer is a professional Broadcast quality ATSC or DVB-S/DVB-S2 receiver for CATV Headends. It receives up to six independent off air 8VSB modulated digital channels or six DVB-S/DVB-S2 satellite feeds along with two separate ASI inputs (8 inputs total!) . These streams are multiplexed into two UDP 54mbs GigE streams through its data port and two ASI streams. Along with itâ€™s program drop/add multiplexing feature, PSI/SI editing, PID re-mapping, service filtering it also can insert EPG (Electronic Program Guide), CA (Conditional Access) and data casting information into each output stream. BISS function embedded will carefully de-scramble your tuner input programs. (IN DEVELOPMENT). NEW with 2 year warranty and technical support from Thomason Broadband.